At the end of another week of half term holiday activities, West Devon Swords delivered fencing and archery for both of OCRA‘s Sport and Art Days, using the Go Fence and Arrows plastic kits, plus a dedicated, full metal Fencing and Archery Camp sandwiched between. 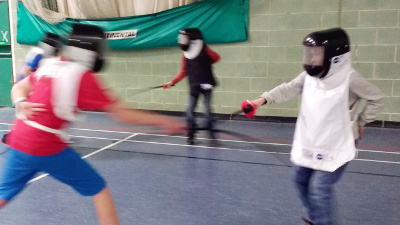 With ages ranging from 6 years to 15, and around 130 children passing through the two Sport and Art days, our fencing and archery sessions were met with the kind of excitement you expect for Santa or ice cream. Our first archery session attracted a group almost large enough to re-stage Agincourt! 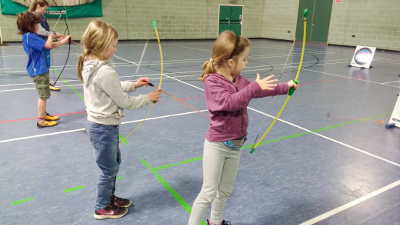 With even the youngest beginners keen to have a go and chuck some arrows down the range, the focus was on turning sessions around to get the maximum amount of time with the bows. 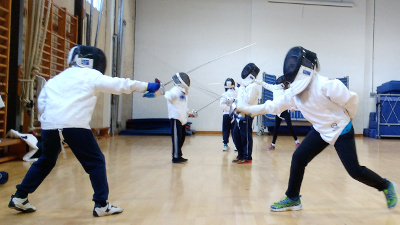 WDS has been bringing fencing with the plastic kit to schools and youth groups around the area for some four years now, so the number of returnees increases at every event, which means less time on the introduction and more time in actual bouts, with a few fencing games thrown in. Our fencing and archery camp had a more manageable number of participants, several of whom we’d seen before, this time taking to sabre with swash and swagger. At no time was safety in question, nor were there any warnings for hard hitting, despite the intensity of the bouts.